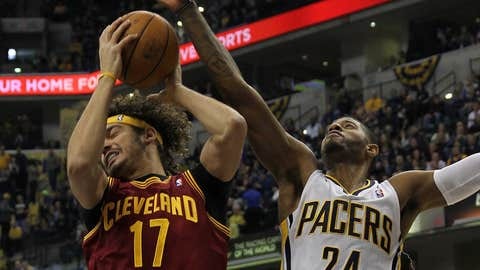 Cleveland Cavaliers center Anderson Varejao grabs a rebound away from Indiana Pacers small forward Paul George during the first quarter at Bankers Life Fieldhouse. INDIANAPOLIS (AP) — Paul George scored 21 points, Roy Hibbert added 19 and the Indiana Pacers used a dominant fourth quarter to blow out the Cleveland Cavaliers 91-76 on Tuesday. The Pacers (25-5) have won eight in a row over Cleveland, their longest active streak against any opponent. They limited the Cavs to 3-of-16 shooting and forced seven turnovers in the final period to turn a close game into yet another victory. Cleveland (10-21) dropped its sixth straight despite getting 14 points and 11 rebounds from Anderson Varejao. Point guard Kyrie Irving was limited to 10 points, five rebounds and five assists. 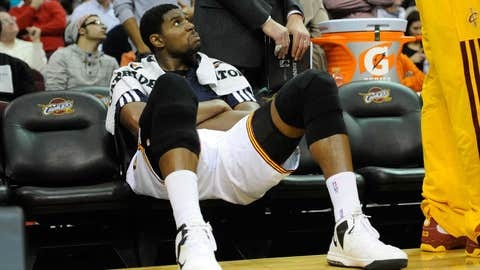 Irving briefly went to the locker room in the third quarter with a left knee injury. The Cavs shot 36.2 percent from the field and committed 15 turnovers. George Hill had 13 points and six rebounds for the Pacers, who have won five in a row and sent the Cavs to their eighth straight defeat in Indianapolis. Indiana outscored the Cavs in the fourth quarter 26-10. The Cavaliers went ahead 17-9 on Earl Clark’s midrange shot with 4:22 left in the first quarter. But the Pacers’ reserves dominated their Cleveland counterparts in a 10-3 surge that put Indiana ahead 35-34 on Danny Granger’s finger-roll with 4:57 left in the half. Hibbert’s jumper with 3:22 left in the half gave the Pacers a 39-37 edge, before the Cavaliers settled down and rallied. Dion Waiters’ driving layup with 26 seconds to play gave Cleveland a 44-41 halftime lead. There were four ties and seven lead changes before the break. The Pacers put together a 15-6 run to take an 80-72 lead on Hill’s layup with just under 7 minutes left in the game. Cleveland never got closer than six the rest of the way. George’s emphatic dunk put Indiana ahead 91-74 with 2:41 to play. NOTES: Indiana began a 10-game stretch in which it plays nine teams with losing records. . The Cavaliers have just two road victories, tied for the fewest in the league. . Indiana trailed after three quarters for only the sixth time this season.